In my email, I told him about the church we attended on Easter Sunday. But I didn’t exactly write to him to complain. Instead, I waited to write to him until I felt I had that moment in church like the hundreds of moments I had at Southwinds. Do you want to know the truth? I have gone to church just three times since we moved back to Minnesota. Once was on Christmas Eve with my dad (at the Catholic church), the next was two weekends ago at another local church, and the third was last weekend for the Easter service. Yes, qualifying me as “that Christian” who goes for the holiday only. I have been so afraid of what we would (or wouldn’t) find at a church here because, well again, compared to Southwinds back in California I didn’t think that anything would even vaguely compare. I was re-baptized at Southwinds in California very intentionally….because I loved that church so hard. I was literally excited every single Sunday because the church, the people, the Pastors, and the message were there for me when I hit near bottom, as I climbed on out, and everything in between. It was a come-as-you-are church. And the music was incredible! But this past Sunday, Ryan and I decided to venture out a little. We decided to try a church about 20 minutes from where we live and that (from the looks of it online) had a very similar feel and vibe to that of Southwinds. From the moment we walked in, it felt like everything we were used to back in California. We got the kids situated at kid care, and then we sat down, just in time for the band to start. 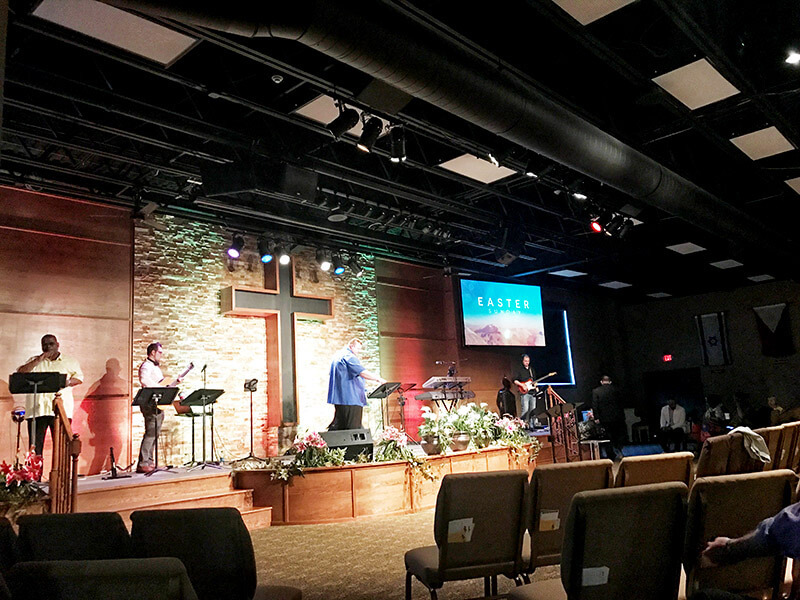 It was a different service, given that it was Easter and they had about 30 minutes of straight music, but for me, that day, it was exactly what I needed. As the band played and sang “Resurrecting,” I had tears. I found myself taking this huge sigh of relief because I finally was in a place that made me feel the way Southwinds did and I was able to receive the message and God’s presence more than ever, which I’ve been desperate for during this journey with my dad’s cancer. I have only ever been in one church where I really felt out of place. Rarely will you find a church that isn’t filled with incredible people and a positive message. It bothered me that I couldn’t just settle on a church back here in Minnesota. I’ve grappled with the whole idea that “church isn’t about me.” I wanted to just go wherever was most convenient because it is supposed to be about simply praising the Lord. But in the end, Ryan and I couldn’t go to just go, and do the motions of church life because it was something we felt we had to do. We were looking for a place that would have us constantly seeking that strong desire to learn and know the Lord more because that is the point, not the motions to simply show up. There is nothing compared to Southwinds, but I am so grateful for what happened on Sunday. On that day, over 3 months since attending a Southwinds service, I was finally present and excited for all that might come at a new church home. p.s. I still am (likely always will) following the Southwinds messages online. You can, too. They are all HERE. I have felt the SAME way since moving to NC. So many great things about Southwinds…. the people were the best.